The phrase, “One person, one vote” has long been an aspirational feature of United States elections, but battles over redistricting often highlight potential ways for our system to fall short of such an equitable aspiration. Four core dimensions of social equity provide a rubric for understanding how drawing district lines plays a role in enhancing or reducing equity. Recent news here in Virginia includes a federal court ordering adjustments to 26 state legislative districts’ lines. The impact of these changes on social equity could be significant. In 2011, new district lines were drawn by state legislators which heavily protected most incumbents of both parties. Some accused the approved plan of packing African Americans into several existing minority-majority districts, thereby protecting those Democratic incumbents, while making surrounding districts safer for Republicans. In the 2015 House election, 54 of the 100 seats were uncontested in the general election, including 37 held by Republicans. Though the plan was approved by the Justice Department, a 2014 lawsuit challenged the plan. In 2018, after a remand from the Supreme Court, the federal district court ruled the 2011 lines unconstitutional. When the 2018 General Assembly could not agree on new lines, the court selected a plan that would affect 26 districts (analysis courtesy of the non-partisan Virginia Public Access Project (VPAP)). While much of the news coverage focused on the potential gains or losses for political parties, these events highlight a range of social equity issues. Some of these impacts are discussed below using a rubric of four core dimensions of social equity articulated by noted equity scholar Susan Gooden. 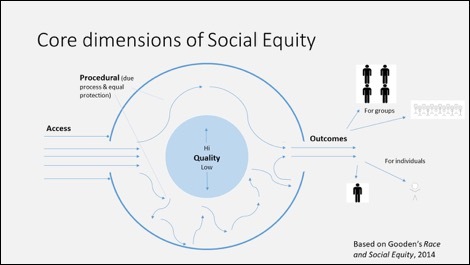 They are also summarized in the visual below: equity of access, procedural equity, equity in quality of services and equity in outcomes. One dimension of equity is access to the spaces where decisions are made and services are provided. The analysis noted above by Adams et al. cites 2012 research by Hayes & McKee showing that the changes in district lines create information costs for voters in knowing where to go; costs that in turn suppress turnout by African Americans. State legislators drawing the boundaries of the districts where they will be elected creates an obvious issue of procedural equity–self-interested legislators have much greater power than the average citizen. Other states like California have taken the step of removing legislators from the process and giving the challenge of drawing district lines to an independent commission chosen by impartial judges. This debate is ongoing in Virginia as well. 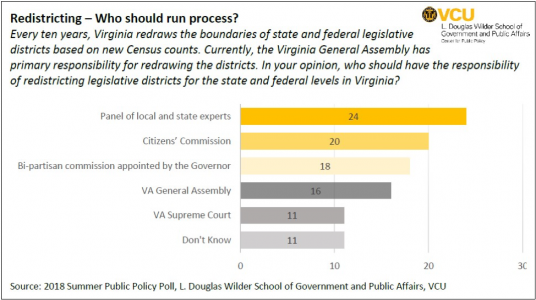 Recent poll results from VCU’s Center for Public Policy show that leaving control of redistricting in the hands of the General Assembly has support from only 16 percent of the population. Most legislators would claim that they represent all the people in their district. But legislators are also subject to operating from a worldview formed by their experience. Cracking or dividing up certain communities (for example urban or African American) among multiple districts that are anchored by large suburban swaths may lead to legislators who “get” suburbia (e.g. traffic congestion and the need for more travel lanes), but who are less articulate about the challenges confronting urban areas (e.g. transportation for those who don’t own cars). Those areas that legislators don’t “get” receive lower quality representation. Perhaps the equity issue cited most often in redistricting is one of outcomes: does the group of elected officials mirror the overall population? 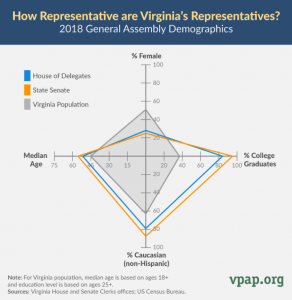 As evidenced by the VPAP visual, Virginia still has a ways to go. Creating majority-minority districts to increase the chances that an underrepresented group (e.g. African Americans or Latinos) are able to elect a member of that group has been a key practice in increasing the diversity of elected officials. A key question of the Virginia debate is whether, with increased openness of some white voters to vote for a minority candidate, a minority-majority district is necessary, or might actually be less than optimal since doing so reduces the minority voting power in many of the surrounding districts. This is by no means a comprehensive listing within each dimension. However, the rubric of four core dimensions provides a helpful framework for teasing out the range of potential impacts on social equity. Author: Author: Grant Rissler is a full-time parent and an affiliate faculty member in the L. Douglas Wilder School of Government and Public Affairs, Virginia Commonwealth University (VCU) as well as current secretary of the ASPA Section on Democracy and Social Justice (SDSJ). His broad research focus is social equity and peacebuilding with particular interest in local government responsiveness to immigrants. Grant can be reached at [email protected].